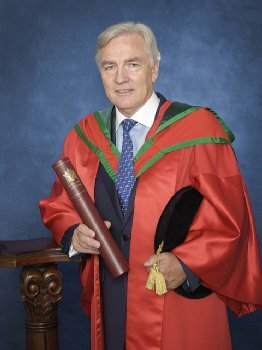 Prominent businessman and native of Rostrevor, County Down, Len O’Hagan is to receive the degree of Doctor of Science for his services to business development. As Chairman of Belfast Harbour Mr O’Hagan is at the helm of one of Northern Ireland’s most important economic assets. Apart from being the region’s most important seaport, the Harbour is also a major logistics centre, a focal point for industry and home to major urban regeneration projects such as Titanic Quarter. Belfast Harbour is also on course to become one of the UK’s leading renewable energy hubs with the proposed development of a £40m terminal to support offshore wind farm projects in the Irish Sea. Mr O’Hagan has a distinguished pedigree in business development and has held a number of senior positions with a range of international companies, including Managing Director of the Jefferson Smurfit Group, CEO of Fitzwilton PLC and Chairman of Safeway Ireland. He is also currently Chairman of business consultancy company OHC Corporate Advisers Ltd, Chairman of Rockingham Motor Circuit, Vice President of the Ireland US Council and was appointed as a Deputy Lieutenant for County Down in 2010. Away from the cut and thrust of the world of business, Len O’Hagan has carved out a role for himself as champion of the arts in Northern Ireland. He is Chairman of the Metropolitan Arts Centre, Northern Ireland’s new flagship home for the arts in the heart of Belfast’s Cathedral Quarter, which is due to open in 2012.